I was appalled when I heard that Westminster Council were proposing to make it an offence to offer food to the homeless, and even more so when I found that they also want to fine those sleeping on the street in their borough up to £500. Of course if people had £500 they would not be choosing to sleep on the street. When I heard that a protest was being organised against the proposal I was keen to photograph it and try and get as much publicity as possible for the opposition to the by-law. The afternoon started with what was advertised as a Flashmob, but rather to my surprise people turned up early and stood around chatting, waiting for it to happen. 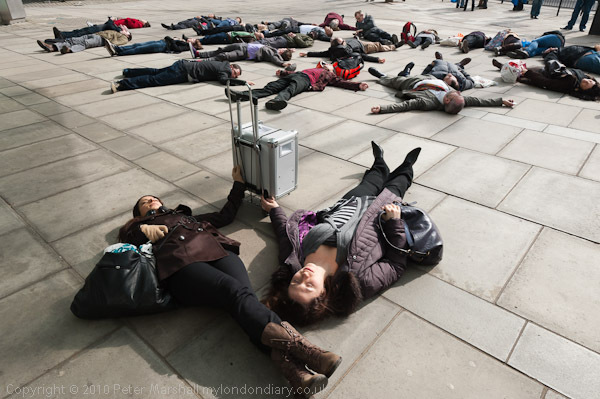 Which it duly did at the specified time, with people getting horizontal on the pavement as Radiohead’s ‘Just’ started and keeping flat on the ground until the song ended. 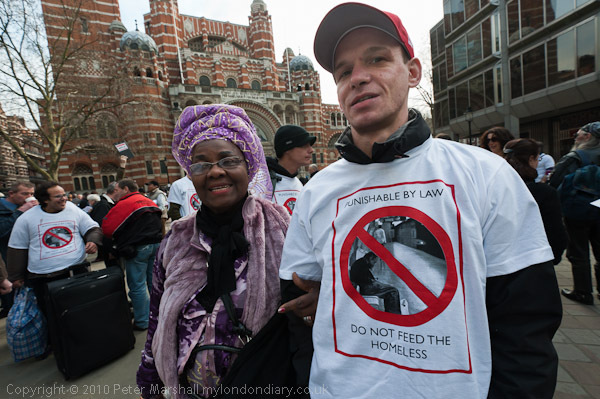 Then we all went back to Westminster Cathedral plaza, where a number of people had been sleeping rough – and some were woken by the music as tables were set up and food to give away loaded onto them. Usually at public events I photograph those taking part without thinking at all about their privacy – they have chosen to be there and act in public, but this was perhaps rather different. I decided that I did not want to take pictures – or at least not identifiable pictures – of those who were sleeping rough without being reasonably sure that they were comfortable with being photographed and having their pictures used. 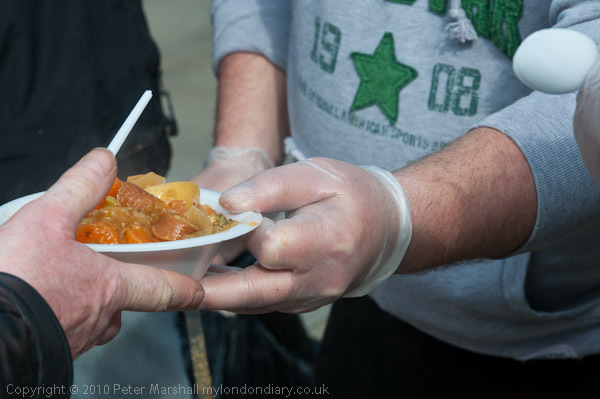 The free food was available to anyone who wanted it – I’d eaten on my way to the event so all I had was a couple of crisps, but those eating included some of those who hand it out at various ‘soup kitchens’ and other events around Westminster as well as passing tourists and the homeless. But I think the pictures I took were more powerful because of that decision, which made me concentrate on how to communicate rather more than usual. And I did photograph those people who were clearly happy to have their pictures taken. Later I looked at work by another photographer from the same party, which was very different to mine, concentrating on the homeless people who came to it. I’m sure that he took his pictures with respect for the dignity of those he photographed and with their permission, but I still felt a little uneasy about the work. It seemed somehow to stigmatize them rather than draw attention to the issues and record the event as I had tried to do. 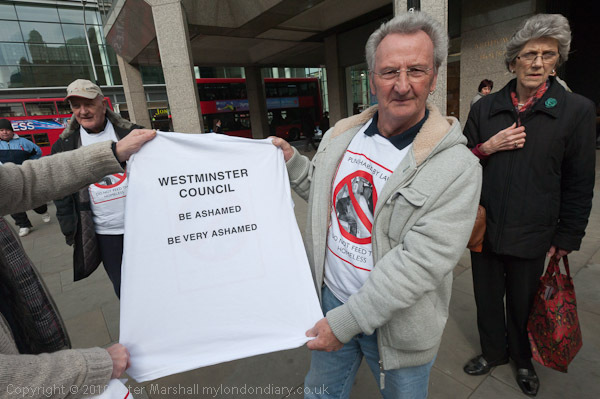 You can see my report and more pictures at Don’t Make Compassion Criminal on My London Diary. This entry was posted on Friday, March 25th, 2011 at 11:51 am and is filed under My Own Work, Photo Issues, Uncategorised. You can follow any responses to this entry through the RSS 2.0 feed. You can leave a response, or trackback from your own site.